ARIEL: Part of your world! FLOUNDER: But it wasn't her fault! First this shark chases, us and we tried to but we couldn't and he grr and we wow! aww and then we where safe and then this seagull came and it was this is this and that is that! KING TRITON: And YOU are just the crab to do it! The little mermaid is a magical story under the sea, with enchanting charecters, heart warming songs, and fun and lauphter, so dive with Ariel, Flounder, Sebastion, Eric, and all those great charecters, for an exiteing adventure into discovery! 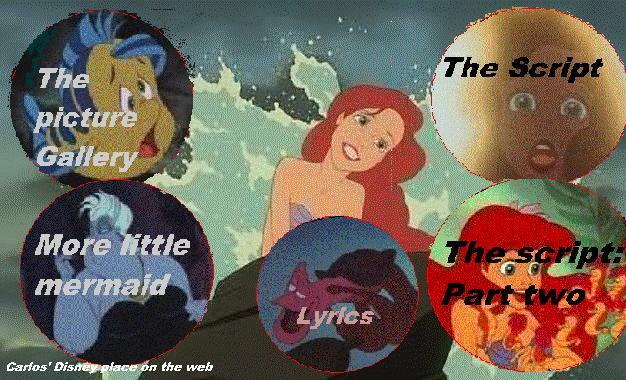 Who is your favorite charecter in the little Mermaid? Eric is a very determiend teenager that always manages to find what he wants to. He has a fury cute dog named Max he killed Ursula the sea witch he has a very cool way of doing things he plays the flute like me he is definetly not a big talker, though he is still really cool! Ursula is the horrible, nasty, and very greedy sea witch. She takes peoples souls for a hobby, and eats live srimp! Ariel signed a contract with her in whitch Areil has three days to make the prince fall in love with her with the kiss of true love. the wicths contract is not fair at all because she put otpsticals so it would be inpossible for Eric to kiss her within three days. This disgusting large octupous is definetly one of the meanest Disney villans. Sebastion is a cool calypso siniging crab. he very nice, though at times he can be a tattle tale or the king gets secrets out of him. Sebastion is very smooth like when he sang "KISS THE GIRL" and "UNDER THE SEA". He is small but has a big heart! Use the below banner to link to my site! Click on the below image to view my Disney animated heroines page for Ariel! VISIT OTHER PAGES ON THIS SITE!